I am happy to be back at the Bangkok 68 hotel, but really want to change rooms. The space allocated to the room is diminished by the size of the balcony, which I have no intention of using. Due to the fact that the room is near the top of the building, the air conditioning can barely compensate for the blistering exterior heat. Happily, another room awaits me on the fifth floor that answers all of my needs, and with the help of one of the hotel workers, my belongings are summarily thrown onto a trolley, moved down to the room on the fifth floor, thrown into the room, whereupon I leave for the city. 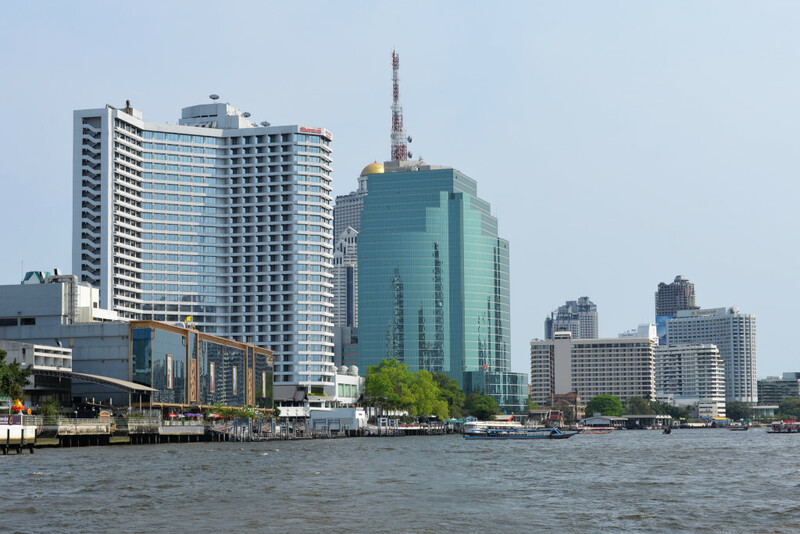 While staying at the Bangkok 68 hotel may be a great idea in principle, travel from outside the city centre becomes cumbersome and relatively costly, as the MRT and BTS lines bill separately, as do the river ferries. Then the centre of the city is not at all served by rapid transit. 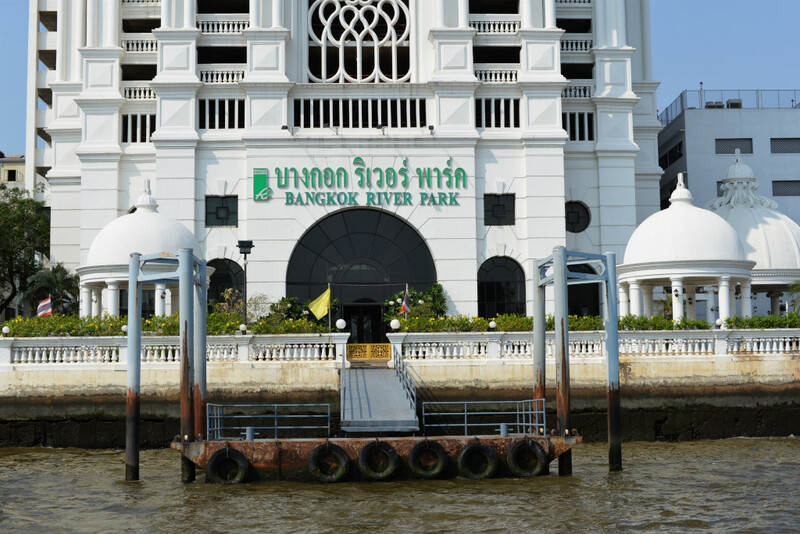 In order to reach the Royal Palace, I could either take the MRT to Hua Lamphong and then continue by bus, or go to Si Lom, change to the BTS line and continue to Saphan Taksin, then finally take the river boat to the jetty nearest the Royal Palace. The BTS and MRT are certainly more efficient than taking the dreaded bus through Chinatown. The expected food vendors at the waterfront are nowhere to be seen, as it is Sunday, which also means that the traffic is not as unbearable as it normally is. 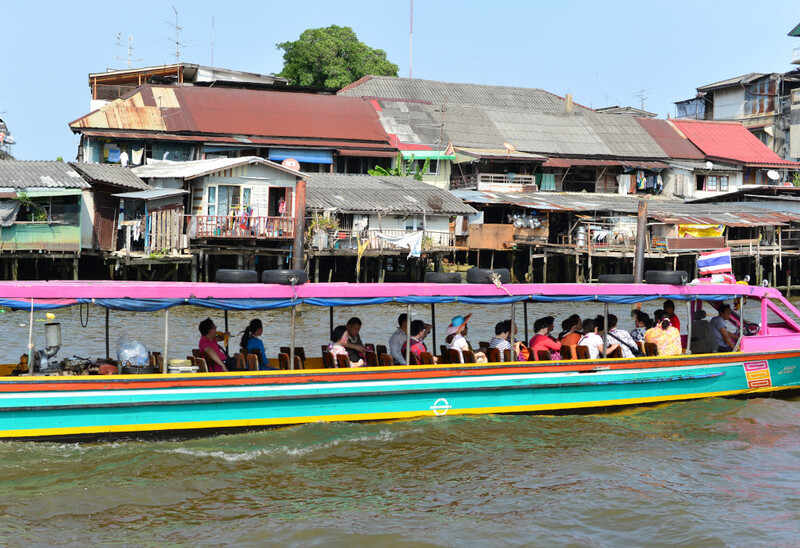 The boat down the Chao Phraya is one of the major attractions in the city, and certainly allows you to experience the city in a different light, although as with so much else here, the hordes of people diminish the thrill of the experience. After all, you are really just taking a boat down a river whose banks are flanked by shining office towers, decaying warehouses, ramshackle corrugated shacks a vestige of another era and for some strange reason not torn down, overpriced boutique hotels whose pedigree amounts to a direct exposure to the relatively squalid waterfront, and a few somewhat contrived boutique plazas. 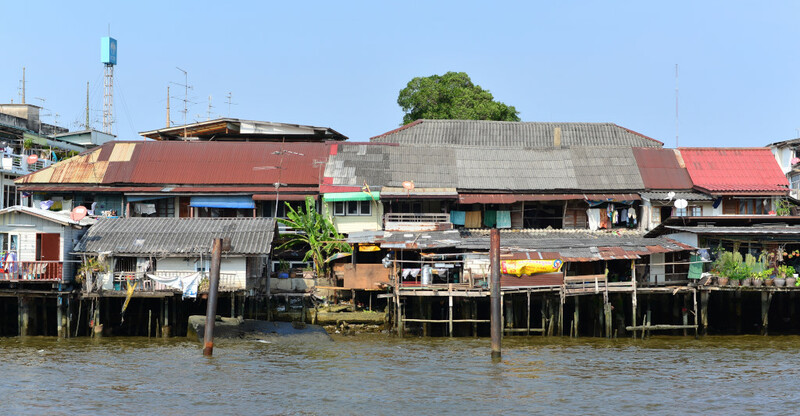 We approach the Tha Tien jetty, and being at the back of the boat, I am readily the first to jump off, wading headlong into a dense crowd. No matter how much the facilities are expanded for tourism here, there just are more and more people wanting to use the service. Looking at the demographic of travelers, a sure way of collapsing the international tourist trade would be to begin defunding European pension plans, although in the major Thai destinations, large numbers of other higher income Asian groups also figure importantly. 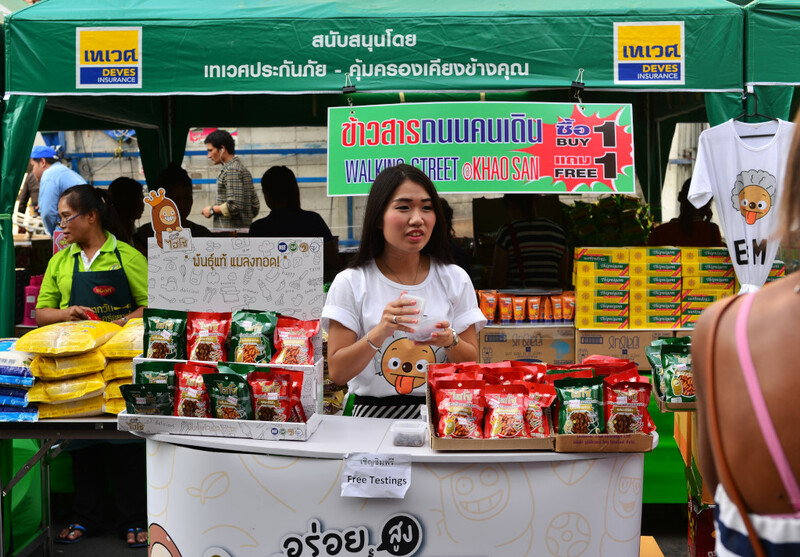 A flurry of food vendors with grilled meats, surimi, seafood, juices and diced fruit greet the passengers descending from the ferry, Wat Pho on one side and the whitewashed walled compound of the Royal Palace on the other. It turns out that I have to trek all the way around the enormous property, and should probably have descended at the next jetty. But no matter – here I am, trudging along past the somewhat incongruous collection of amulet vendors selling their mysterious wares to the gullible and spiritual, the demographic diversity of the sellers itself compelling. The occasional tuktuk driver yells at me, but these drivers are not desperate for business, considering the numbers of tourists on hand. The crowds of visitors swell along the pavement on the entrance side of the Royal Palace, a stern-looking woman with an identification badge around her neck pointing somewhat absurdly to a sign telling visitors to not trust wily people. I ask her whether she is one of those wily people I should not trust, but she doesn’t smile. The palace has just closed I am told grimly as the entrance vomits a torrent of visitors. I get the feeling my presence is not welcome, and so move on. 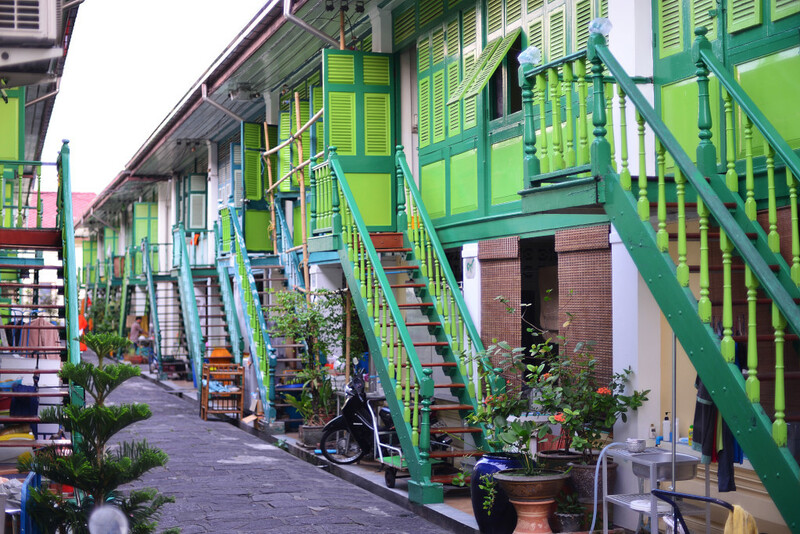 Sadly, the visit to the Royal Palace was really the purpose of my trip into town, but no matter, there are other things to see, such as Khao San road, which I really want to get some photos of with the hope of catching its uniquely surreal cachet, without being too put off by the place. The walk past the Sanam Luang grassy oval that lies to the north of the palace passes by the university, a monastery, some allegedly historic buildings that the king had a hand in, the brown placards in front detailing the good deeds of whichever king for the benefit of whomever in nauseating detail. My luck runs out at the National Museum, which is only open for another 15 minutes, and will be closed the next two days, after which I plan on leaving Bangkok again. 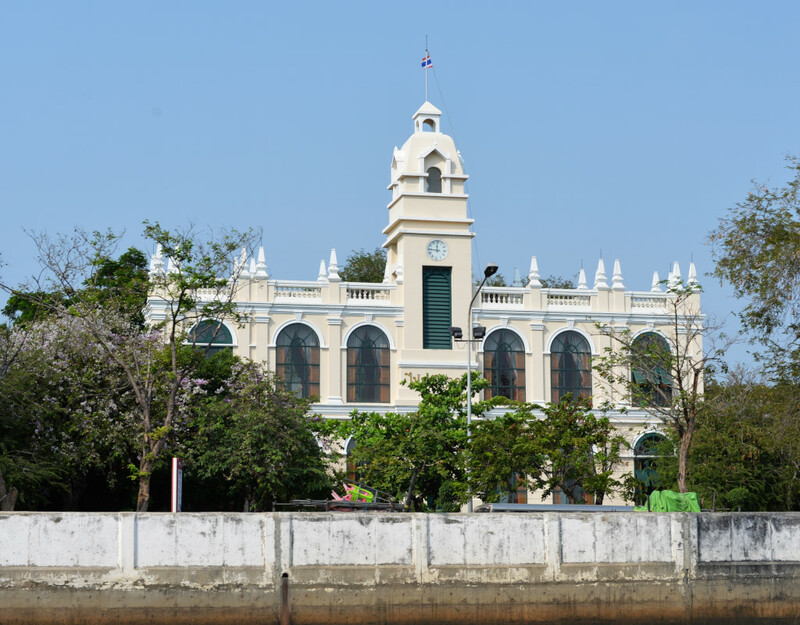 I am granted a quick walk around the central building for the short period it is still open, the history of the country and its intimate ties to royalty explored in great detail, which I would to some extent have been exposed to already in the former royal capitals to the north. That said, I am not sure what amount of retention I would experience in the museum to begin with, even if I had all day to take the information in. Without asking, one man points me in the direction of Khaosan road, the other repeating ’50 baht’ to take me there, which seems a bit ludicrous, considering it is a five minute walk from here, although it does involve running across a few major traffic arteries. 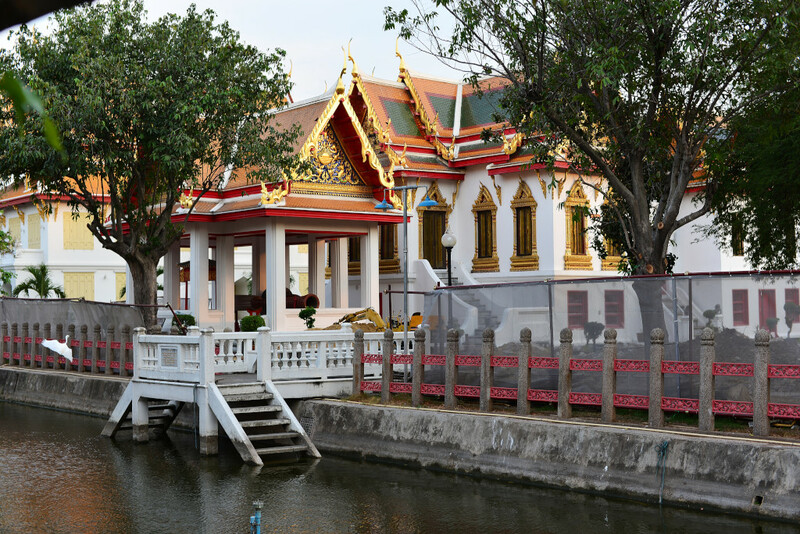 As little as I would want to stay in this area, it certainly is perfectly located relative to the central attractions of the city, and wouldn’t require the long treks from north Bangkok into the city. 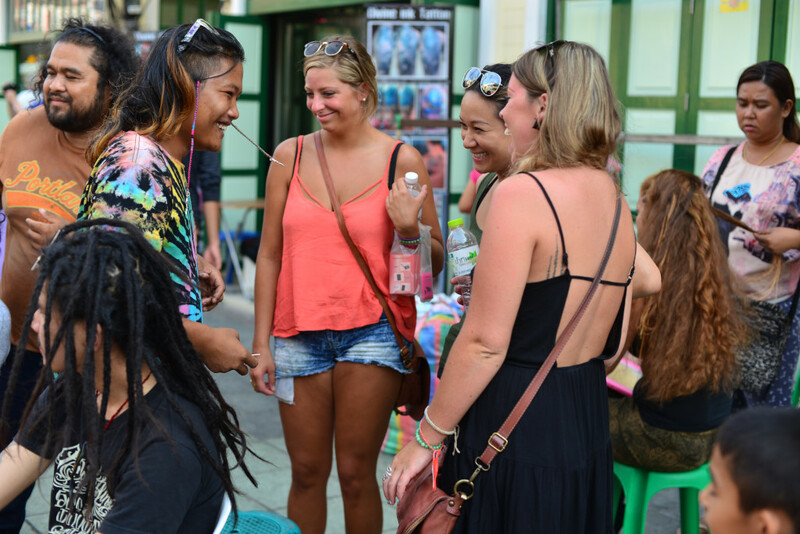 Khaosan road just seems to present a sad farce of independent traveling. 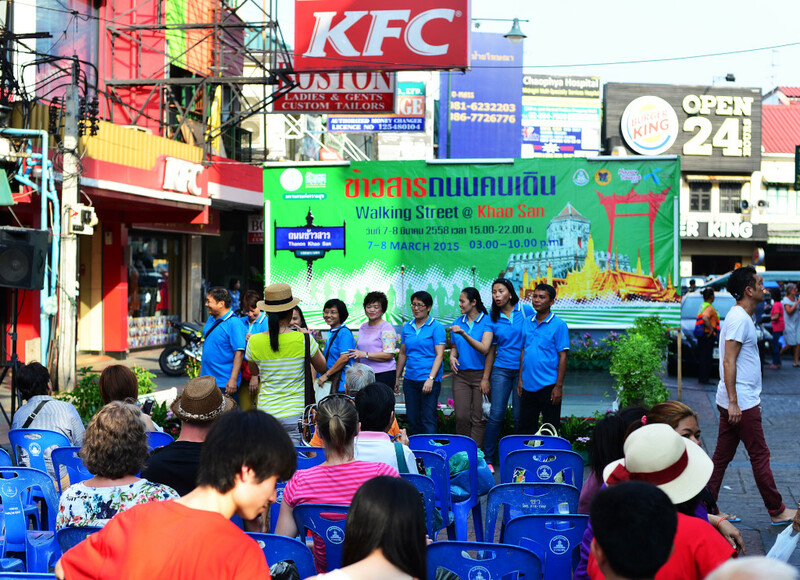 This phenomenon would hardly be exclusively the responsibility of the Thai, who are the grand masters of mass tourism. 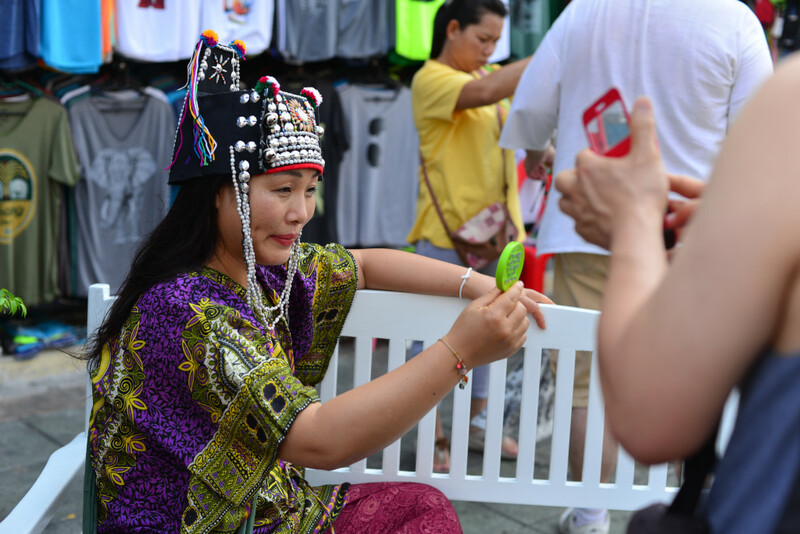 The bulk of visitors are suburban youth from North America and Europe, although there are also quite a few younger Asians. 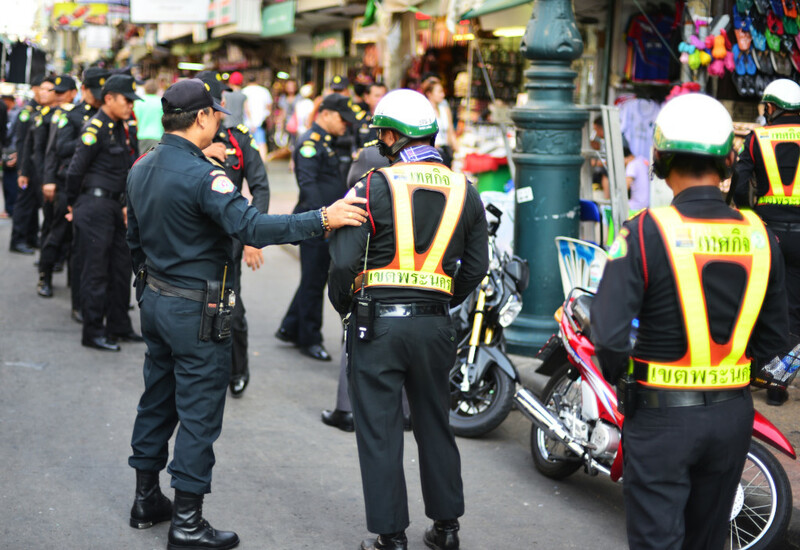 A row of city policemen is arranged in some sort of formation, although it is not really clear as to what the point of their efforts is. 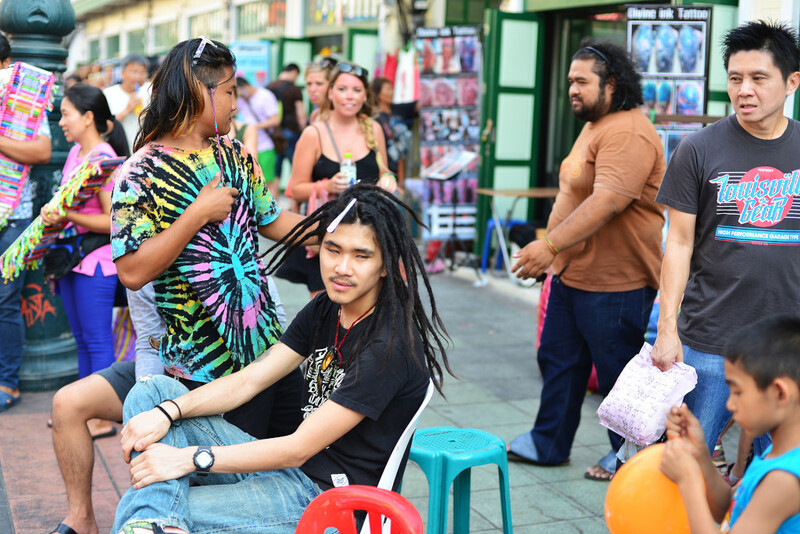 Wildly tattooed locals with outlandish hair styles braid the tresses of eager young visitors against the backdrop of crowded bars and chain establishments lining either side of the road. 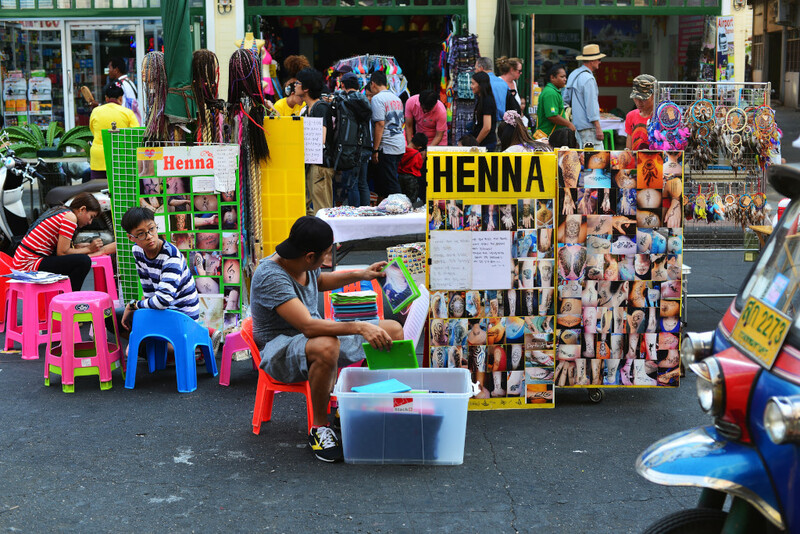 A somewhat legitimate side of Khaosan road is presented by the column of vendors selling typical Thai street foods, grilled seafood and surimi, cut fruit, pad Thai, other noodle and rice dishes, deserts, dim sum, and dumplings, often miniscule portions at not particularly modest prices, at least for Thailand. Then again, it is not clear how anyone can survive from selling a few grilled bananas or bowls of noodle soup in this city. This is definitely not the most interesting time of day to visit, although I am loath to come here later, due to the arduous trek back to the area I am staying in. I have an idea as to how to head east from here, and it will involve walking down Thanon Phra Sumen, which is already a much quieter and more respectable area than Khaosan, although it is somewhat difficult to navigate with the very abbreviated free maps provided to tourists. 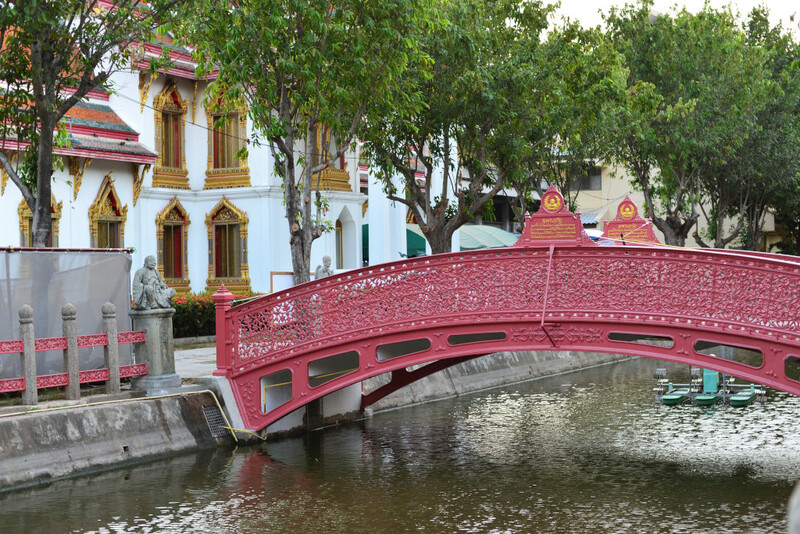 Most visitors would simply hand over money to the tuktuk drivers and get ferried around, which is hardly the worst idea. But beyond being cheap and mistrustful of the tuktuk and taxi drivers, I don’t want to forgo interesting photographic opportunities, and yet at the moment I feel anything but inspired. As I continue trying to reconcile the names on the street signs at an intersection with those on the map, a tuktuk drivers points out where I am and the major attractions of the area, interleaving his explanation with ‘tuktuk 50 baht’ which I ignore, even though a tour of the area for that price would be fairly cheap. It doesn’t help that several different names are used for the same street, which makes orientation somewhat confusing, even though street signs are ubiquitous. Apparently, there is a giant Buddha somewhere in the area and access to the Buddha is free. 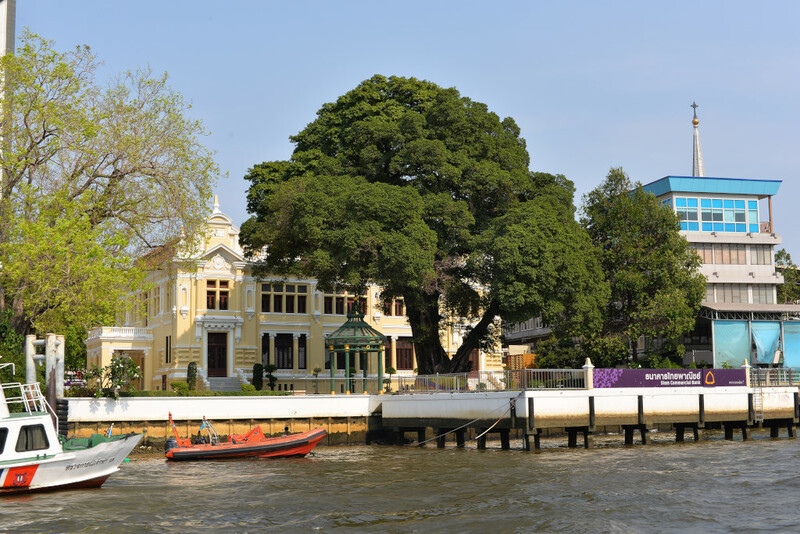 Walking up Thanon Prachathipatai toward the Dusit Palace Park, I see no evidence of any giant Buddha in the area, nor do I really care, considering how many litter the landscape in Southeast Asia – and in much more memorable settings. At the military compound across from the gardens, a soldier motions that the park is closed – just for the day, as I have yet again come too late. Look around the somewhat desolate environment, it really seems I have wasted the day, leaving my hotel room to see the sights sometime in the mid-morning not the best idea. 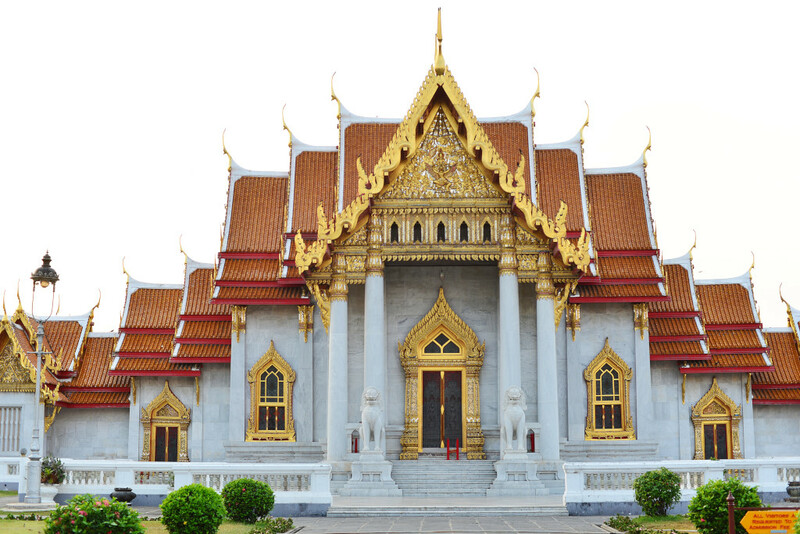 Across from the palace gardens lies Wat Benchamabophit, significant to the royal family, and certainly very close to their residence, although to the lay person, the Buddhist temples all end up looking the same. At least there are virtually no tourists to be found in the area, the arteries flowing along the gardens moderate in traffic this late Sunday afternoon. The Chitralada complex faces a sports field and stadium, followed by ministries alternating with police presidiums and military barracks, just to make it very clear to the errant visitor as to who is in charge here. Despite the area being the hub for the Thai royal family and hence power in the country, it somehow feels empty and uninspiring. I continue southeast on Thanon Ayutthaya towards the train tracks, crossing the Rama 6 expressway, and then onwards to the Phaya Thai corridor, the narrow roadbed crowded by the massive concrete ramparts of the BTS and soaring glass towers on both sides, the physical evoking a comparable sense of mental confinement. 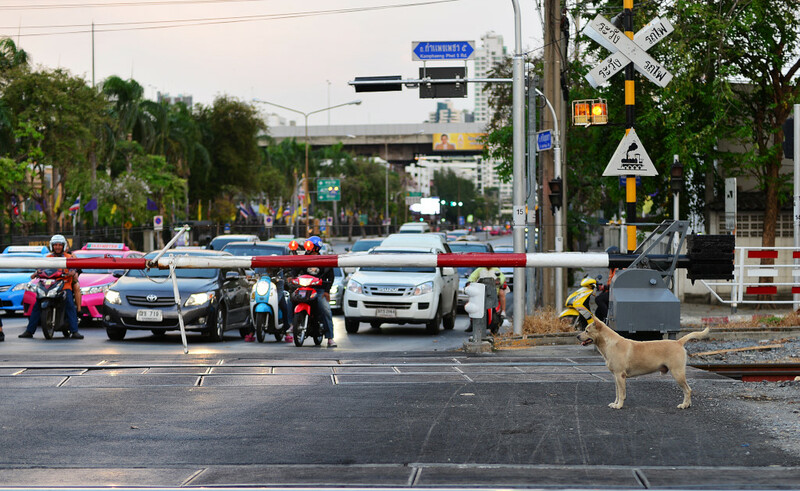 The Orwellian drama of the alienated city culminates with the raised bed of the BTS line arcing eastward along Rama I boulevard, the fray of Siam Square splayed out before me. Siam Square at once refers to a physical shopping mall but also an entire district that has become one of the world’s ultimate shopping extravaganzas. 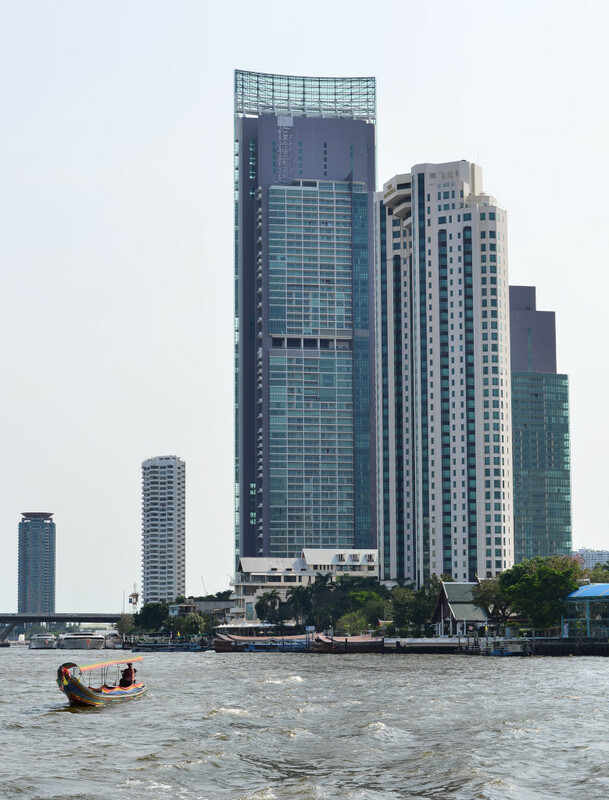 Gigantic buildings squat along Rama I with impeccably maintained alleys radiating to the sides of the main road. The structures compliment the sea of glass, concrete, neon and people, seen from the vantage point of the claustrophobic path weaving through the cacophony of roadside vendors and food stalls, asphyxiating and distressing, particularly for anyone who would rather bath in the fires of hell than visit a shopping mall. The downside to such an extravaganza of consumerism is that the products and services being offered merge into each other, despite legitimate and even successful attempts at stylishness both in the interiors and exterior cladding. 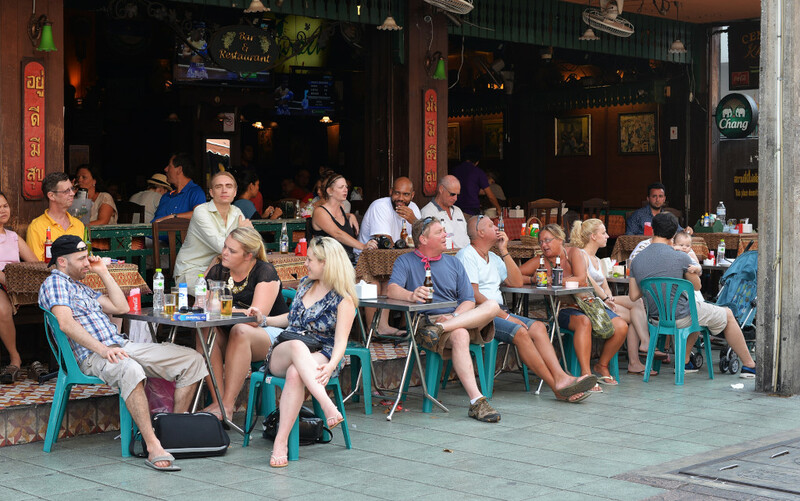 The streets are heaving with traffic and visitors, many of which are foreign tourists. I read on Wikipedia that tourism visits from abroad peaked several years ago at about 26 million, which is about 40% of the population. 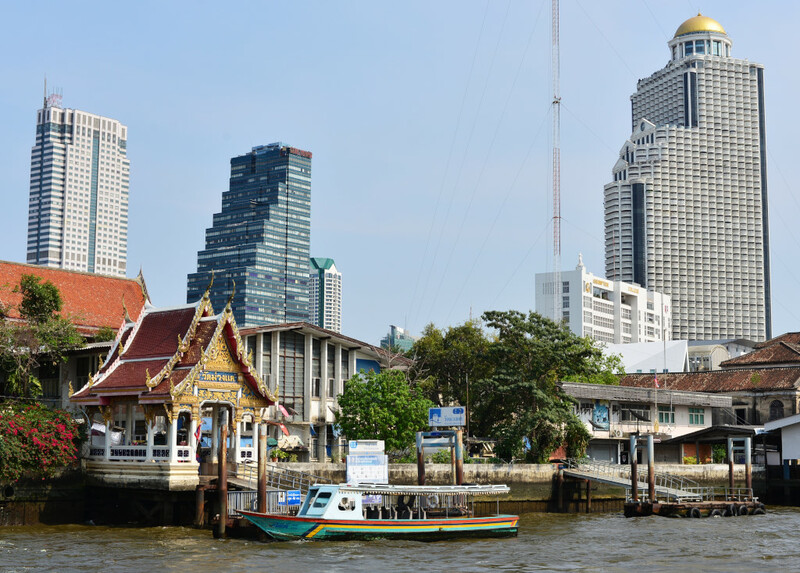 Bangkok rates as the third most touristed city in the world, and Pattaya and Phuket also rank, although of course they are effectively small towns with vast numbers of visitors. 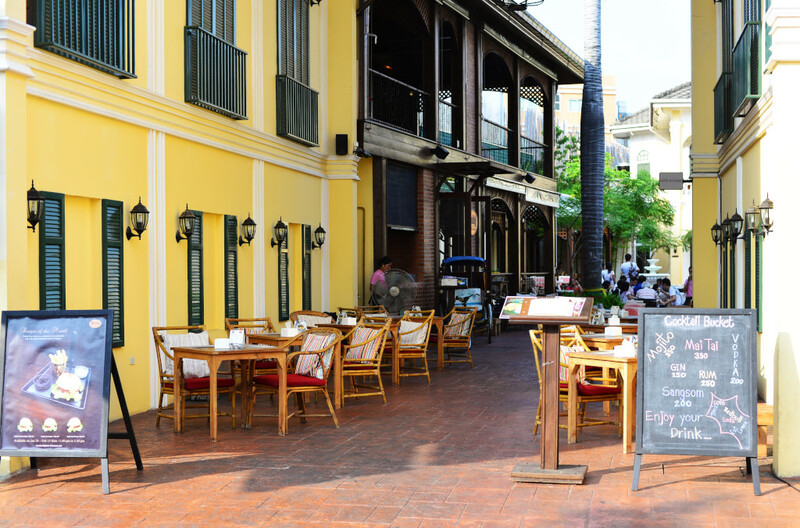 The experience of visiting the Siam Square area makes me feel decisive about avoiding the beach resorts to the south, which would largely be motivated by the desire to create a coherent overland trajectory into Malaysia. An alternate itinerary would be to travel northeastward into the Isan area of the country, and then fly back to Bangkok or somewhere in the south when my visa is about to run out. Even the metro is absolutely jam packed, a reminder of how large the population of the city is, although most of the passengers are younger, at most in their mid-20s, and the vast majority of solo travelers are hunched downwards, eyes glued to their cell phone displays. I find it difficult to cull a sense of uniqueness or authenticity from the people I see around me, little beyond the global culture of consumption, identification with fleeting trends, and anonymity. It sure is nice in the end to get back to my spacious new room at the hotel with functioning hot water, proper lighting and drainage in the bathroom, air conditioning that really cools, never mind the desk, chair, large bed and functional décor.